You can swing by Amazon's website any old day and purchase a Fire TV Stick for $40, but that's just the 1080p version. The 4K-compatible Fire usually costs $70. That's not the case today. 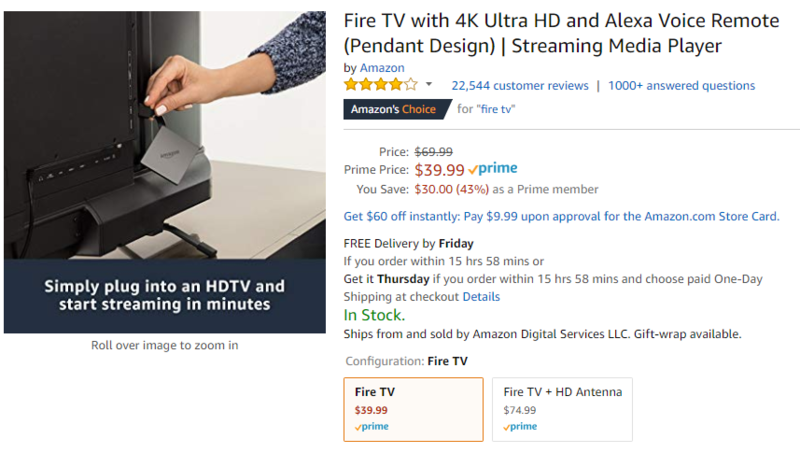 Amazon Prime subscribers can get $30 off the 4K Fire TV right now. The 4K Fire TV is a bit larger than the 1080p Fire TV Stick, but it still just dangles behind your TV. It runs Fire OS, so you have access to Alexa and all the usual Amazon content. You're probably buying this one because you want to stream 4K video, though. You can watch UHD TV and movies through apps like Netflix as well as Amazon's own Prime library. At $40, the 4K Fire TV is the same price as the Fire TV Stick. Again, this discount is only available to Prime members and only for a limited time. How limited we do not know, but don't wait too long. There's no reason to get the Fire TV Stick if you're a Prime subscriber.